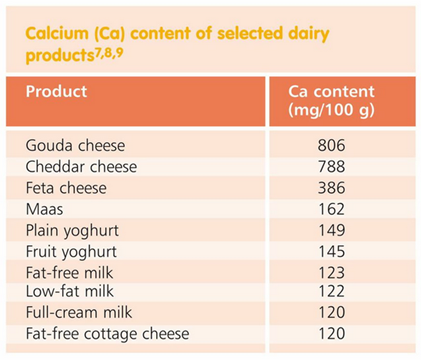 Dairy intake and calcium from dairy have desirable links with weight management. Protection against weight gain, lower total and central body fat, favourable metabolic profiles, effects on energy balance and appetite, and maintenance of lean body mass during weight loss efforts are part of the intricate interaction. South Africa is not exempt from the international epidemic of obesity. According to the most recent South African Demographic and Health Survey (2003) and the National Food Consumption Survey of 20052 more than 50% of adult women are overweight or obese. The problem is also emerging amongst South African children and adolescents, although the overall prevalence differs amongst population groups and regions. The well ­known association between obesity and non-­communicable diseases of lifestyle (including hypertension, coronary heart disease, type 2 diabetes and metabolic syndrome) highlights the burden that overweight and obesity place on the well­being of the nation. Many studies have investigated the association between aspects of dairy intake and body weight management. In recent years, these individual studies have been systematically reviewed and analysed to establish the strength of the evidence. Some conclusions from these comprehensive reviews are summarised below. Findings suggest that people who consume milk or dairy are protected from weight gain and tend to be able to maintain a healthier weight. This suggests a negative association between dairy intake and weight gain: an increase in dairy intake is associated with a decrease in body mass index. Increasing calcium intakes from 400 mg per day to 1200 mg per day is associated with a decrease in body mass index from 25.6 kg/m² to 24.7 kg/m². Consumption of calcium from dairy is linked not only to lower body weight but also to lower percentages of total body fat and fat in the abdominal area. It is well known that body composition and body fat distribution may be a more important risk factor for the development of non-­communicable diseases than body weight. Dairy has been found to have a beneficial effect in weight loss treatments. Dairy not only facilitates weight loss when it forms part of an energy­ restricted diet but also appears to maintain lean tissue in overweight people on weight loss diets. It has been suggested that there is a possible threshold effect, with more than 600–800 mg calcium needing to be consumed to promote fat loss. This effect seems to be specific to dairy calcium (as opposed to calcium supplements). increases satiety and stimulates food regulatory mechanisms (e.g. dairy protein such as whey may reduce spontaneous food intake). The health­-promoting effects of dairy as part of a diet in line with the Food Based Dietary Guidelines are undisputed. Despite many unanswered questions with regard to the mechanism governing the link between dairy and weight management, research indicates that the mix of nutrients found in dairy products, especially calcium and protein, may play an important role in weight management. As dairy products naturally contain calcium, protein and other essential nutrients, consuming three servings daily may not only contribute to weight management but will also improve the overall nutritional quality of the diet. Department of Health, Medical Research Council. Orchmacro. 2007. South African Demographic & Health Survey 2003. Full Report. Department of Health. Pretoria. Labadarios D (ed.). 2007. National Food Consumption Survey – Fortification Baseline (NFCS­FB): The knowledge attitude, behaviour and procurement regarding fortified foods, a measure of hunger and anthropometric and selected micronutrient status of children aged 1–9 years and women of child-bearing age: South Africa. 2005. Stellenbosch. Armstrong MEG et al. 2011. Eur J Clin Nutr. 65: 835­840. Astrup A et al. 2010. Physiol Behav. 100: 67­75. Louie JCY et al. 2011. Obes Rev. 12: e582­e592. Douglas A et al. 2011. Nutr Res Rev. doi: 10.1017/S095442241000034X. Smit LE et al. 1981. The nutritional content of South African cheeses. Dairy Industry Center. Agricultural­Animal nutrition and animal products. Irene. Smit LE et al. 1982. The nutritional content of South African milk and liquid milk products. Dairy Industry Center. Agricultural­Animal nutrition and animal products. Irene. Smit LE et al. 2006. The nutritional content of South African milk and milk products. Dairy Industry Center. Agricultural­Animal nutrition and animal products. Irene. Teegarden D. 2005. J Nutr. 135: 2749­2752. Chen M et al. 2012. Am J Clin Nutr. 96: 735­747. Van Loan M. 2009. J Am Coll Nutr. 28(1): 120S­129S.